Human history is summarized in one word; hunger. For most of time, humans have been starving or malnourished. At best it was a cycle of surfeit or shortage. 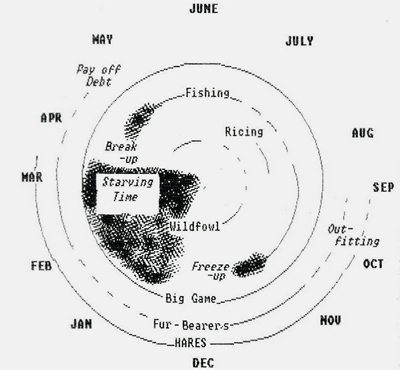 Figure 1 shows a plot of the annual cycle historical cycle among the Ojibwa people of Ontario produced by Professor Roger Suffling. Conditions changed in Europe with the onset of an agricultural revolution. The agricultural revolution was a period of agricultural development between the 18th century and the end of the 19th century, which saw a massive and rapid increase in agricultural productivity and vast improvements in farm technology. The Industrial Revolution would not have occurred without the surplus food created by these changes in agriculture. Surplus food is surplus time, and from it civilizations are created. Most of increased life expectancy, which has occurred in almost every country, is due to better food supply and clean water. There are exceptions, like North Korea, but it is almost always due to bad leadership. 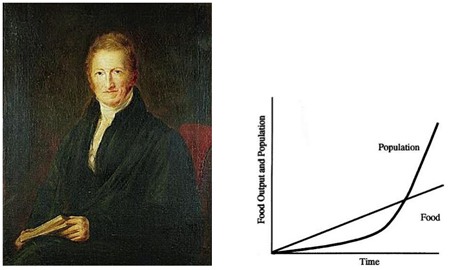 Thomas Malthus misdirected the focus with his claim that population growth would exceed increases in food production (Figure 2). Eugenics is the belief and practice of improving the genetic quality of the human population. It is a social philosophy advocating the improvement of human genetic traits through the promotion of higher reproduction of people with desired traits, and reduced reproduction of people with less-desired or undesired traits. In the 1960s the Club of Rome and its political offspring, the United Nations Environment Program (UNEP), Agenda 21, perpetuated and expanded the Malthusian misdirection. The underlying theme of environmental and climate alarmism today is based on the overpopulation claim. They claim the population increase, especially the developed nations, will exhaust all resources. The claim was laid out in the 1972 book Limits to Growth. This was given gravity by the use of simplistic statistics in a computer model. Every prediction they made was incorrect. Of course, there are some limits, at some point, to some things, but this ignores innovation, adaptation, and substitution. “The battle to feed all of humanity is over,” “In the 1970s and 1980s hundreds of millions of people will starve to death in spite of any crash programs embarked upon now. Despite his failures, most people think the threat remains. However, like so many of these threats, used for a political agenda, it bears little investigation. Worse, Ehrlich knew his claims were false because he acknowledged that only 3 percent of the world is occupied. John Holdren, now Obama’s science Czar, published a book with Ehrlich, Ecoscience, Population, Resources, Environment, that essentially promotes eugenic concepts. 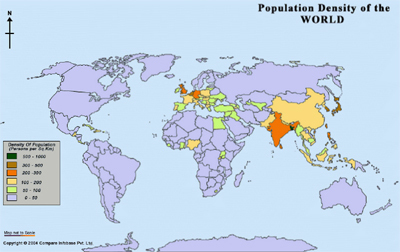 The world is not overpopulated (Figure 3) and there is no shortage of food. It’s estimated we produce enough every year to feed 26 billion people. However, thanks to Malthus and the neo-Malthusians, like Ehrlich, we ignore the real problems that are adequate storage and effective distribution. Estimates vary, but about 60-70 percent of the food grown in developing nations, never makes it to the table. The figure is 30-40 percent for the developed world. Most of the difference is due to refrigeration. Yet what did the environmentalists do but try to ban CFCs with no evidence they were affecting the ozone. India and China opposed the move to ban them because they looked at the science and knew it was unproven, but also because they wanted the advantages of refrigeration. A measure of how little knowledge or importance is applied to these facts is that few know the name Clarence Birdseye II, inventor of refrigeration. Refrigeration also helped the distribution problems, especially when it combined with containerization. Modern container shipping celebrated its 50th anniversary in 2006. Almost from the first voyage, use of this method of transport for goods grew steadily and in just five decades, containerships would carry about 60% of the value of goods shipped via sea. Some crops were adopted and adapted for their relative ease of production and storage. These characteristics were well known about the potato in South America and gave its appearance in Europe such an impact. It is likely that the cool damp conditions of the Little Ice Age (LIA) pushed grain prices up, providing an opportunity for rapid adoption of the potato. 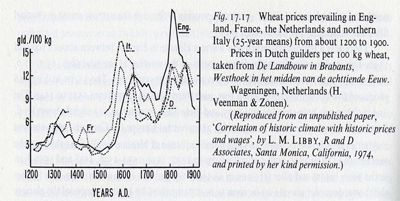 Libby’s study of grain prices for four European countries illustrates the jump (Figure 4). Source: H.H Lamb, Climate, Past, Present and future, Vol.2. 1977. The peasants could achieve a great yield in poor soil and store them for the entire winter. Ireland adopted and became more dependent on the potato than most other countries. It likely caused the surge in population as the census figures show. The population declined to 6.6 million by 1851. 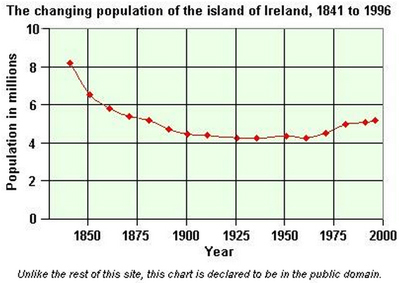 The pattern of population for the Republic is shown in Figure 5. There were famines again in 1877-78, 1885 and 1889-90 that are reflected in the increased decline of population in Figure 2. The book is subtitled, “The extraordinary story of the GREAT FROST and FORGOTTEN FAMINE of 1740-41”, which underscores the different weather conditions of the 1740 and 1845 famines. In 1845, the weather did not directly kill people; rather, the cool damp conditions were favorable for the potato blight. Overdependence on a single crop made the people vulnerable. Other countries, like Norway, also suffered the potato blight, but were not as dependent. The Irish Potato famine was coincident with poor crop conditions throughout Europe. The 1840s are called the “the Hungry Forties” as cool wet summers combined with moderate wet winters. The combination causes harvest failures and malnourished people, who are then vulnerable to diseases that survive and even flourish through the winter. On the eve of the crisis there had perhaps been some complacency as to the power of exceptional whether to upset normal life. Winters had been relatively benign over the previous thirty years. No one, not even those with distant memories of the terrible winters of the 1680s, was prepared for what became known as the Great Frost of 1740 or for “bliain an dir” the year of slaughter of 1741. The 1740 weather illustrates what happens when events combine. We organized the conference on the impact of the Indonesian volcano Tambora because John Eddy’s work on temperature sunspot relations and Hubert Lamb’s work on the Dust Veil Index were raising questions about cause and effect. Temperatures were already declining from the solar activity associated with the Dalton Minimum (1790-1830) when Tambora erupted. Indeed, the time of the Great Frost remains to this day the longest period of extreme cold in modern European history. How does 1740-41 measure up again later, more famous, Great Irish Famine? In terms of relative casualties, the older crisis was undoubtedly the more severe, even taking the lower bound estimate of 310,000 fatalities in 1740-41. More important, these deaths occurred in a relatively short year and a half, while 1845 occurred over some six years. It is the same pattern seen in reports of the 2011 uprising in Egypt that became “the Arab Spring”. The catalyst was a dramatic increase in food prices. At best, these got secondary mention by a few reports. Then, there is a secondary problem: a huge run-up in food costs in recent months. According to the Food and Agriculture Organization of the United Nations, the worldwide food price index is at an all-time high—surpassing its 2008 peak, when skyrocketing costs caused global rioting and pushed as many as 64 million people into poverty. The price of oils, sugar, and cereals have all recently hit new peaks—and those latter prices are especially troubling for Egypt, as the world’s biggest importer of wheat. So the media, like historians, are telling stories, with bias and misinformation. They are driven by the need to blame someone, rather than something. They don’t know how much nature changes all the time, or how much humans have adapted to some of the challenges. They won’t accept that what humans do is natural and part of evolution. As Goethe said, “The Unnatural, that too is natural.” Until we change, the chances of understanding and reacting properly to natural events is unlikely. As Samuel Butler said, “God cannot alter the past, though historians can.” The inaccurate narrative they create is part of the failure of leadership that accompanies each of these disasters. You can’t solve the problem if it is improperly defined, and you can’t plan for the future. The people always pay for leadership failures. Now, because of the misunderstandings and false claims about environmental damage and man made climate change, they want to turn back the advances that have improved the quality of life for most people. Those who still suffer, do so because of their leaders. If you are in Ontario, it is time to pay your Hydro bill.